Batteries are not food. Batteries are toxic. Batteries are not made to be ingested by humans. But if you’ve forgotten this (or are a tiny child who doesn’t know better), a team at MIT has created a small, origami robot wrapped in meat to help solve your problems. 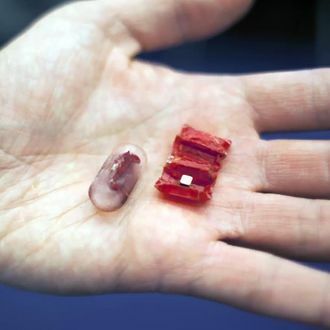 Once swallowed, the meaty exterior (yum) will dissolve and the robot will unfold inside your stomach. From there, doctors will be able to control the robot using magnetic fields to do tasks like guiding a swallowed battery toward … well, you know, or patching a hole in someone’s stomach lining, as Daniela Rus, the director of MIT’s Computer Science and Artificial Intelligence Laboratory, explained in a press release. The bot is still a work in progress and a long way from being used in humans, but given that 3,500 people swallow batteries each year in the United States, there is definitely a need for the lil’ meat robot. No word on a vegan-friendly option as of yet.